Home » Science » Now a Video Game to Cure Dementia! Now a Video Game to Cure Dementia! Have you ever wanted to take to the seas on a global adventure? A new game available on smartphones worldwide from today does just that — and could help dementia patients in the process. The game, called Sea Hero Quest, asks players to set sail in search of precious artifacts — in the form of memories — which can be collected at different locations around the world. As you progress through the game, scientists can use the data you generate to gain insight into your spatial navigation abilities — one of the first skills lost at the onset of dementia. The aim is to get hundreds of thousands of people playing from around the world, to identify what the normal range of navigation skills are among people in general. Once that is established, neuroscientists could then identify further guidelines to spot dementia early. How big a problem is dementia? Despite being potentially preventable in one-third of cases, it’s estimated that someone develops dementia globally every three seconds. In 2015, more than 46 million people were living with dementia worldwide, according to the World Alzheimer Report 2015. 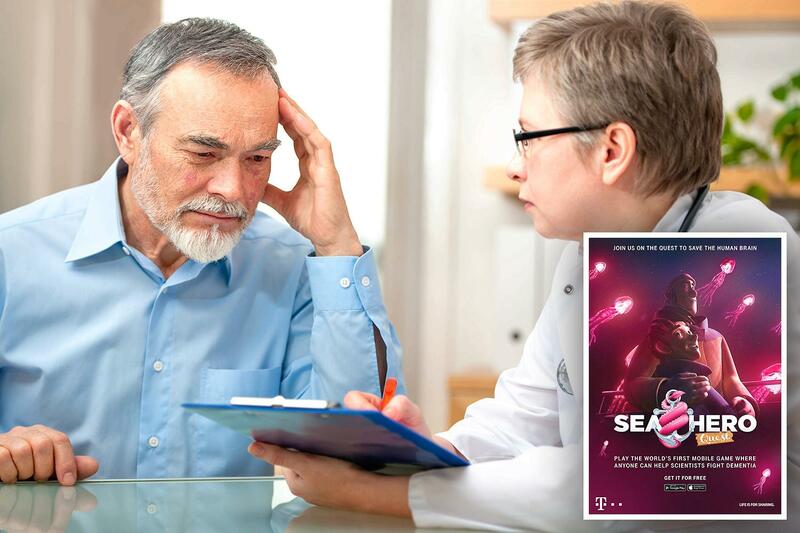 The condition is a collection of symptoms, such as memory loss, difficulties in thinking or problem-solving, and reduced ability to navigate, and is caused by diseases including Alzheimer’s and Parkinson’s. “Dementia is increasingly becoming one of the greatest medical challenges we face globally,” says Hilary Evans, Chief Executive of Alzheimer’s Research UK. Despite the high numbers affected, an accurate test for the condition remains unavailable. But this could be about to change — depending on the popularity of Sea Hero Quest. “[The game] can tell us: ‘How do people get lost?’ saysHugo Spiers, a neuroscientist atUniversity College London (UCL), who is leading the research stemming from the game’s data. “Fundamentally people with dementia — Alzheimer’s dementia — struggle to navigate and on a scientific level we don’t know enough of how people navigate to help really pin down what’s going wrong,” he said. The team want at least 100,000 people to play the game by the end of 2016 to provide the ideal range of data needed to provide this missing information. Data will be anonymous and only available to researchers at UCL. “Step one is establishing this live database of how do people navigate…that gives us the tool to develop that diagnostic,” said Spiers. The team imagine a future scenario in which people suffering from dementia can be identified early — by playing the game — and trialed on relevant drugs to stop the disease taking full hold of their mind. “You could give them [the game] and monitor if the drug is effective in a really powerful way,” added Spiers. In the next stages of the project, Spiers would like to have volunteers play the game while having their brain scanned in order to see which parts of are active, and link this to patterns seen in the population worldwide. “I hope to collect neuroimaging data from people playing this game to really understand how the circuits are activated as people play the game,” says Spiers. This is not the first use of mobile games to crowdsource data for scientists. Cancer Research UK have launched five games to date, including Play to Cure: Genes in Space in 2014, which obtained data as people traveled through space and helped identify codes and patterns along their way — unwittingly. This time, as players travel the seas instead of space, their navigation choices and strategies will be the data of use as they’re set new and changing challenges to test their true abilities. Sea hero quest, available on iOS and Android from May 4, was created in a collaboration between Deutsche Telecom, Alzheimer’s Research UK, Scientists from University College London and the University of East Anglia and game designers Glitchers. Electricity will Convert into Wi-Fi, Charge your Devices Wirelessly! Ever wondered your name is responsible for ruining your career!! !